I would like to wish all my friends and followers Happy Thaipusam and Happy Holiday. Many Tamil Hindu devotees and tourists celebrate Thaipusam in Malaysia at Batu Caves today. 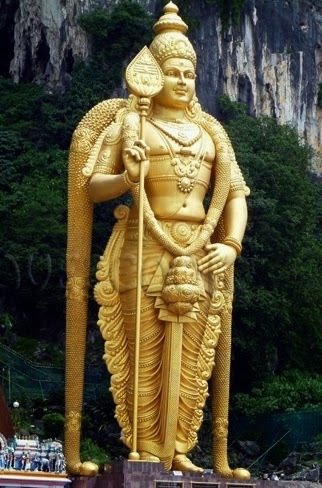 Thaipusam festival is to commemorate the occasion when Lord Parvati gave Lord Murugan a Vel "spear" so he could vanquish the evil demon Soorapadman. Lord Murugan or Kartikeya is the Hindu god of war and victory. Lord Murugan is Commander of the gods; son of the Lord Shiva and Lord Parvati, his brother is Lord Ganesha. Usually the Hindu devotees would take a vow to offer Kavadi to Lord Murugan if their wish is granted. The kavadi procession to Batu Caves starts at the Sri Mahamariamman Temple, Kuala Lumpur and proceeds for 15 kilometers to the caves and climbing the 272 steps to the top. Devotees carry containers containing milk as offering to Lord Murugan either by hand or in huge decorated carriers on their shoulders called kavadi. Today the temple will be packed, if you wish to go there please try to take public transports. You can take KTM from KL Sentral or RapidKL buses. However during Thaipusam, there are many public buses to Batu Caves from Puduraya and Kotaraya bus station. Just look out for signs indicating Batu Caves. The motive of Thaipusam festival is to pray to God to receive his grace so that bad traits are destroyed.